This brick school was built on land purchased from a Mr. Acheson, William Imeson (Lot 20 Con. 10) and R.A. Wilson. The Merry Makers, a local club, raised money for playground equipment and the installation of electricity. Pearl Richardson was the first teacher in 1914, and Norma Devlin was the last in 1967. When the first log schoolhouse burned down about 1840, Alex McTavish donated land for a schoolhouse across the road from Lot 12 Concession 1 Drummond. 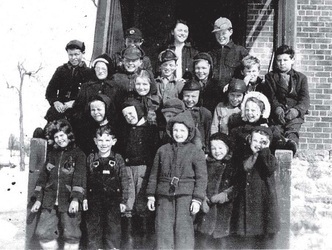 In 1940, the school won first prize for the Improvement of Local Schools in Lanark County. The original school was built in 1854 on W1/2 Lot Con. 2 Beckwith. In 1867, the teacher was Mary Ann Conn. The second school was built by Benjamin James for $650 in 1873. Mrs. Dorothy Cavanaugh was the last teacher in 1967. It burned down and no longer exists. 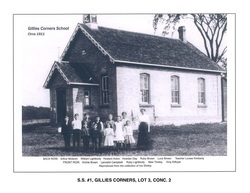 The first schoolhouse was built in the 1820s at Gillies’ Corners on Lot 3 Con. 2 Beckwith. A white brick building replaced it in 1881 until 1966. Donald Conboy was the last teacher. S.S. No. 5 Drummond was the first log school in the township, built in 1817 with cedar shakes for the roof, on land owned by Thomas White. Duncan McCormick was the first teacher. In 1903, the school section was divided into numbers 6, 8 and 12. This school was originally built in 1820 on Lot 1 Cons. 6 Bathurst. It became a union school with No. 9 Bathurst on Lot 25 Con. 6 Bathurst sometime before 1890. A third school was built across the road in 1952 before it closed for good in 1967. The first school on this site existed in 1842. Ralph Davidson built the second school in 1872. Annie Mary Enright came from Ireland to be the first teacher with a salary of $200. In 1867, Letitia Murphy instructed. William Spence won L.H. James Gold Medal for have the highest marks in the Perth Collegiate Grade 8 Entrance Exams in 1937. Mrs. Gladys Thomas was the educator when the school closed in 1968. James Code owned Lot 16 Con. 3 on Tennyson Road where the first log school was built. John H. Flemming was the teacher in 1867. In 1875, land was purchased for the second log school on another part of the lot from for $50. A brick building was erected in 1916 with a basement, furnace and single seating for forty students. U.S.S. No. 10 Drummond & No. 5 Beckwith existed at Tennyson in 1874. The school had a 30-foot well in 1877. The school closed in 1966 and the children were bused to Caldwell School in Carleton Place. In 1820, Balderson’s School was the union school S.S. No. 11 Drummond & S.S. No. 14 Bathurst at Balderson’s Corners on Lot 1 Con. 8 Drummond. In 1868, an unused Orange Hall was purchased for $525 and moved across the street. 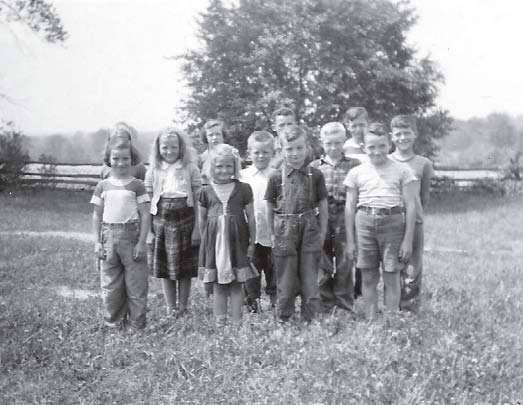 It served as the only two-room school in Drummond Township until 1968. McGarry’s School was built on Lot 11 Con. 7 in the 1820s. Peter McGarry sold some property for the second log school in 1873. Twelve years later the teacher, Miss C. Sinclair, had maple trees planted on Arbour Day that still exist today. 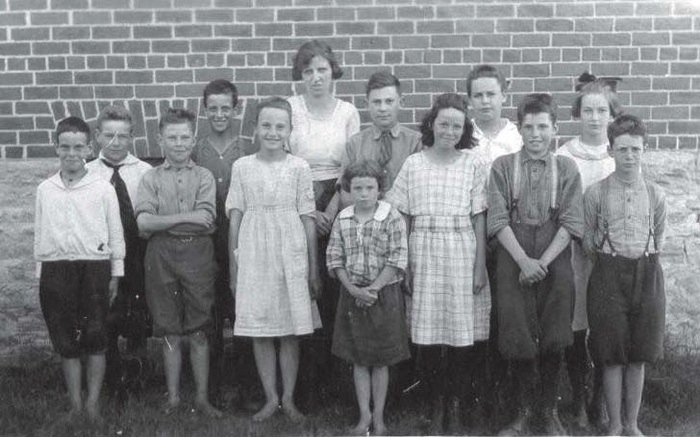 Joyce Widenmaier won the public speaking contest and had the highest standing for the Grade 8 Entrance Exam in 1942. Richard Shaw won the public speaking contest for Lanark County in 1966. Mrs. Laura Ireton Thompson was the last teacher when the school closed in 1968. The first log school, built in 1818, burnt down and a second one was erected 1870 in Drummond Centre with Mr. Stewart as the teacher. It was furnished with one blackboard, a sheepskin for an eraser and five maps on the walls. Twelve students sat in two rows of pine planks. Miss Winifred McRostie was the last teacher in 1929. Next, a modern brick building boasted a library, teacher’s room, two cloakrooms, hot-air furnace, flush toilets, pump room and play area. 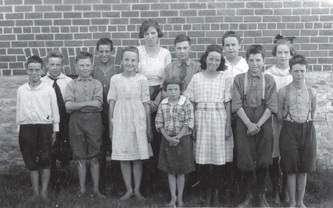 Start student, Roy Warner won the T. Eaton Co. Cup as Champion Pupil at the Drummond Rural School Fair, the Drummond Centre Women’s Institute prize for highest marks in arithmetic and composition, and the Lawrence James Gold Medal for the highest marks for the Entrance Exams in Lanark West and. In 1952, Mildred Stead Munro taught there for $1700 a year. Mrs. Carmel Fergusson was the last teacher in 1968 when the school closed. Blair’s great grandfather, George McIlquham, donated the land for S.S. No. 15 Drummond in 1840. The first log building was eventually torn down and a rough lumber structure erected, but it was too small for the growing community and the site was wet and muddy, so a brick building was built across the road on Chas Campbell’s farm. The Maple Leaf Literary Society donated a 6-shelf library in 1915 and in 1925 chemical closets were installed inside the school. Various items were purchased over the years with money made at annual Christmas concerts, including a victrola, a teacher’s chair, a basketball, a water cooler, an aquarium with five goldfish, and a first aid kit. 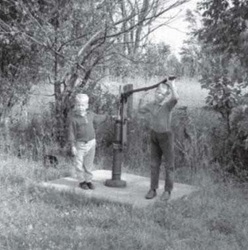 In 1948, electric lights were installed and a well was drilled. The school was finally closed in 1965 and is now a private residence owned by André Messier. In 1867, the teacher was Agnes Forgie. In 1867, the teacher was Andrew Patterson. In 1867, the teacher was Melissa Smith.